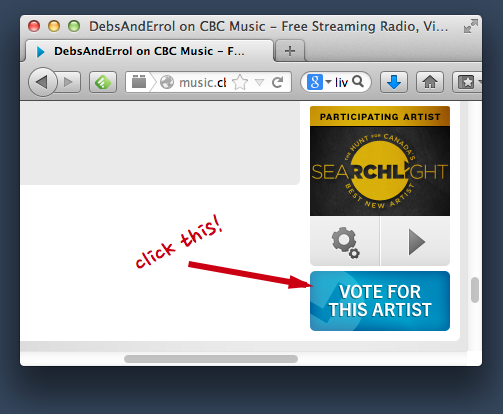 Join us in supporting indie geek musicians by voting for them in #Searchlight, an online competition being held by CBC Radio (the Canadian Broadcasting Corporation) to discover Canada’s hottest new musical talents. You can vote once a day for up to 10 bands until April 6th! How can you win? Follow the steps below! Scroll down to the bottom of the page..
Editor’s Note: Sadly, Nerds With Guitars had internet problems uploading and couldn’t get their song in. Show some love and check them out because they are fundamental in supporting and promoting Nerd Music in Toronto! Step 2: After Voting, Share or Tweet this page! After you vote, every day, we want you to tweet on twitter or share on facebook with the two tags #VoteGeek and #Searchlight! If you mention @cbcmusic, that’d be awesome! And for you Facebook people, please tag our facebook page so we know you shared it! Also add in #VoteGeek! You can vote once a day, and you can vote for up to 10 bands in one day. Winners will be chosen by a combination of voting and influence! That’s right, we are going to track how often your posts/tweets get shared! Errol joined so many hashtag tracking sites. Getting other people to share your tweets is also key! Thanks for all the support, folks! And let’s inundate Canada with geekery! Voted and shared it on my FB feed. Sadly I’m not on Twitter because I just found it better to go directly to the the links. Well, twitter can be exhausting! Now the challenge is to try and get nerdy.fm to promote the contest for you- because that’ll take the exposure to a whole new level. * Laughs * Good point, MP. I shall message them right now! And yes I totally already own most of the prizes in digital format. But it’s a contest, and there are geeky cool priiiiiizes! And you can get them in PHYSICAL FORM! You can talk to Debs about that. See the trick is to open all the voting tabs at once and the only way to rid yourself of the perky heavy metal blues cacophony is to vote for each as quickly as you can and close that tab! It ensures you get your votes in! It finally let me vote! Its been crashing every time I try but I kept trying.